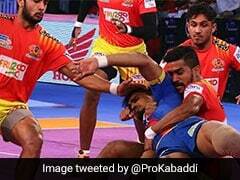 U Mumba defeated Bengal Warriors 31-20 to register their 14th win in the 2018 Pro Kabaddi League. U Mumba rode on a collective effort from their raiders and defenders to beat Bengal Warriors 31-20 in a Pro Kabaddi League (PKL) match at the Rajiv Gandhi Indoor Stadium in Vishakhapatnam on Saturday. It was their 14th win in the season from 19 matches. Later in the other match, Telugu Titans defeated Jaipur Pink Panthers 36-26 at the same venue. Raider Siddharth Desai led the attack for Mumbai and collected seven points. Mumbai captain Fazel Attrachalli, Surrender Singh and Rohit Baliyan chipped in with four points each in Bengal's routing.